Paul Michael Merhige, 35, is charged with killing four relatives on Thanksgiving. (CNN) -- A tip from a television viewer led to the arrest of a Florida man accused of killing four of his family members on Thanksgiving Day, authorities said early Sunday. Paul M. Merhige is accused of fatally shooting his twin sisters, a 6-year-old cousin and a 79-year-old aunt at a family home in Jupiter, Florida, on November 26. One of his sisters was pregnant. 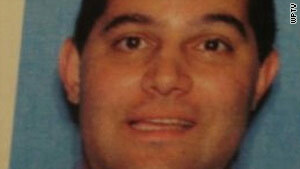 Authorities say Merhige also wounded two other family members. A viewer of "America's Most Wanted" recognized descriptions of Merhige and his car, authorities said at a news conference early Sunday. Officers immediately responded to the tip late Saturday, surrounding a small motel in the Middle Keys, part of the Florida Keys. Merhige, who had apparently been at the Monroe County motel since December 2, did not resist apprehension by U.S. marshals, authorities said. It was not immediately clear whether he was armed when marshals burst into his motel room, more than 200 miles from Jupiter. Merhige made a first appearance in a West Palm Beach, Florida, court later Sunday morning in a hearing that lasted only minutes, according to CNN affiliate WPTV. He is charged with four counts of premeditated murder and attempted first-degree murder. Asked by the judge if he had anything to say, Merhige declined comment, WPTV said. His next court appearance is scheduled for February 1. He will be held without bond at the Palm Beach County jail. Jim Sitton, father of 6-year-old Makayla, who was killed, told CNN affiliate WPTV late Saturday that he would "sleep a little better tonight." "I won't be patrolling my house with a shotgun, looking for the monster. ... I've been in protective mode," he said. "This doesn't bring Makayla back. I'm not jumping for joy. Her room is still empty. But the monster is in a cage now." The "America's Most Wanted" tipster told authorities that Merhige had checked into the Edgewater Lodge motel under the name John Baca and provided an address in Homestead, Florida, according to a news release from police in Jupiter, Florida. No one at the motel was immediately available for comment, but its Web site included photos of waterfront rooms, efficiencies and townhouses starting at $89 a night. Merhige had paid cash at least two weeks in advance, the U.S. Marshals Service said in a news release. He was on a computer when marshals burst into his second-story room. Merhige had tried to disguise his 2007 Blue Toyota Camry with a car cover and had switched its vehicle tag with one from another car he'd owned, the statement said. He also had shaved his head in an attempt to disguise his identity, the Monroe County Sheriff's Office said. Last month, the marshals added Merhige to their list of the Top 15 most-wanted fugitives. A total of $100,000 was offered as a reward for information leading to Merhige's arrest, the sheriff's office said, and the tipster may be entitled to it. The agency also released some distinguishing characteristics about Merhige, saying he was known to either fake or display symptoms of obsessive compulsive disorder, such as frequent bathing and shaving, and difficulty making decisions. He also had faked or displayed symptoms of chronic fatigue syndrome, and taken several prescription drugs for the ailments, the agency said.